There are many fields where progress is rapid and then slows to a seeming halt, during which time people debate what it all means. Often the impetus for further progress comes from a seemingly unrelated field. A=B, B=C, therefore A=C ... Si- knows that A=B and B=C, so it is not about a relationship between two (or more) letters/objects. Te+ draws a conclusion, i.e. "therefore A=C". B=C, therefore A=C ... Ni+ perceives a possible relationship between A and B. Te- speculates that A and B are equal. A person observes an interaction between a wife, husband and another woman. The wife is arguing with the woman. Ni- perceives a possible relationship between the woman and the husband. Fe+ speculates that it is probably a sexual relationship. Fe+ is also about a relationship, so it doesn't know the most relevant relationship. Te-, on the other hand, knows that A=B is a relevant speculation. You and I have discussed this before. My (and socionists') focus is: What kind of information does a function process? Your focus is: How does a function/cognitive process actually work? The big question is whether these definitions cover all kinds of information or not. Socionists tried external/internal, static/dynamic and object/relationship... and failed. I get repetitive when someone suggests that without knowing how a function actually works, the information that it processes can be predicted. It's somewhat like trying to determine how to properly feed 8 (or more?) unknown, unseen animals by only visually monitoring their combined feces and then labeling each animal according to it's predicted food consumption. You don't have to know how a function works in order to know what kind of information it processes. For example, there is obviously a cognitive function/process that determines the relative size of objects. This description is itself a certain kind of information. The actual process of weighing/evaluating also "produces" information, which is unknown to us. But that information is irrelevant. But that doesn't mean he is right. We are trying to distinguish between 8 different kinds of information. That is not an obvious task... socionists have tried hard but failed. Yes, I have read Gulenko and he doesn't make any sense. "Any self-regulatory activity involves at least 4 steps: goal definition, implementation, input(collecting the data) and output (presentation of the result). 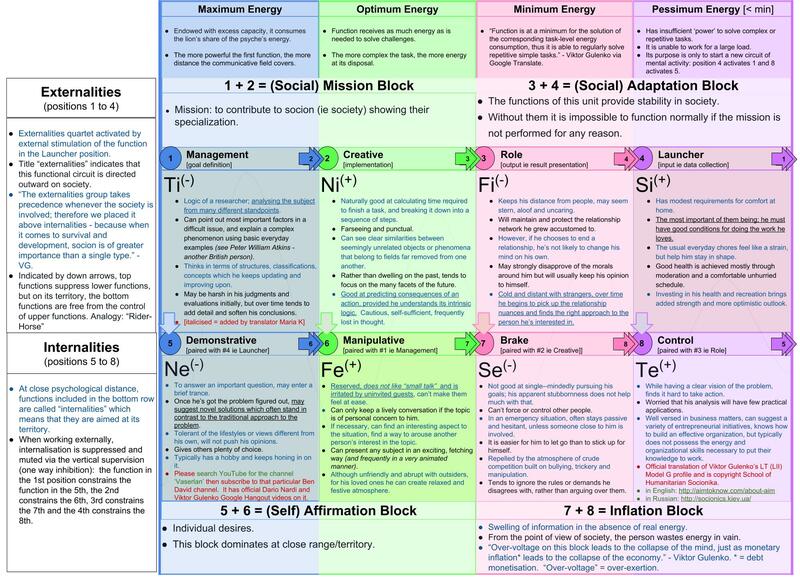 In socionics, the minimalist model has 4 blocks as well. Let's take a better look. Block 4: (the most sensitive) new data input/ collecting the feedback"
LII has Ti/Ne... then Ni/Fe (!?) ... "Mission: to contribute to socion showing their specialization". He ignores the fact that Ti and Ne are static functions, and Ni and Fe are dynamic functions (in Socionics). Another big problem is that Ti/Ne doesn't make decisions. Otherwise a person would make four different kinds of decisions (Te, Ti, Fe and Fi). But we don't... we do four evaluations but make one decision. A third problem is that we don't see Ni/Fe in LII. IEI's mystical insights completely contradict LII's clarity.